Moments with the Mays: Blog Challenge - a place I want to visit! 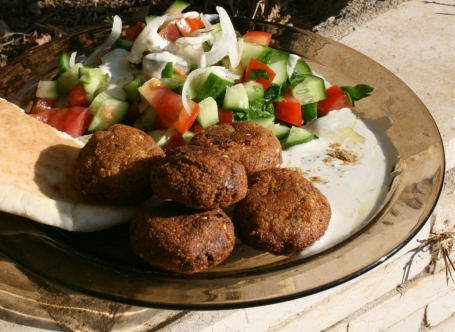 If I could visit once place it would be the home of these tasty little nuggets known as falafels...GREECE! I love all of the colors when I see pictures from Greece. It's beautiful! Ever since I saw "Sisterhood of the Traveling Pants" I have wanted to go to Greece. Really, I would just love to travel throughout Europe! Where would you go?? Go visit Kristy @ I Heart Hicks (btw, why can't I add a link anymore?! it isn't working! help!) to check out the blog challenge! I like the way your face looks! ;o) I have no idea why your links are busted! I come from a family that loves to travel so I've been fortunate enough to have already seen many countries; however, I really still want to visit Australia & Sweden, and go on an Alaskan cruise. Take me take me!!! Would love to go to Greece! The Sisterhood of the Traveling Pants is my total inspiration for wanting to visit Greece!! I want to go there and ride a donkey to my (non-existent) Greek Grandmothers house! i think of that movie every time i see greece pictures! i would love to go too!